"I think he's doing a fabulous job." Greg Palast deserves a whole lot of credit, for he's been one of the foremost muckraking journalists covering the presidency of George W. Bush since the contested 2000 election. Nobody has done more than Palast in exposing the profound electoral problems, in Florida especially, and in documenting the all too cozy relationships between the Governor's office, the firm hired to purge the Florida rolls of alleged felons, the willful denial of the office of the Florida Secretary of State, and the subsequent disenfranchisement of thousands of Floridians, a disproportionately high number of whom are members of ethnic minorities. It's not too tough to do the math: Bush beat Gore by a margin of less than 600 votes; tens of thousands of African Americans, a group who voted overwhelmingly for the Democratic candidate, weren't allowed to vote, courtesy of Governor Jeb Bush, Secretary of State Katherine Harris, and the partisan apparatus of state government. Insult to injury, of course, is that Palast's stories were yawned at as yesterday's news in the U.S., while his employers, the BBC and the Guardian of London, expressed appropriate measures of outrage. Unfortunately for the purposes of this review, however, all of the above doesn't necessarily mean that Palast is a documentary filmmaker of the highest caliber, and what you'll find in Bush Family Fortunes is little more than red meat to those already lined up with Palast�s politics. This film certainly suffers by coming after Fahrenheit 9/11; Michael Moore has stolen a good deal of Palast's thunder. But that doesn't mean that what he's talking about isn't outrageous; it certainly is, and should give pause to even the most ardent supporter of four more years. Palast appears almost as a parody of a journalist, in his trenchcoat and fedora (pushed jauntily back on his head), and it's hard to know at first if we're expected to take him seriously; but soon it's clear that obviously we are, even if he puts in a performance that's ripe for a Daily Show parody, with a look of incredulity never leaving his face. Despite its title, this film is pretty well focused on George W. Bush, with only peripheral mentions of his father and the rest of his family; there's talk of the sinister work of the Carlyle Group, and of James R. Bath, the direct link between the houses of Bush and Bin Laden. (Anybody who's seen Fahrenheit 9/11 will be familiar with this.) 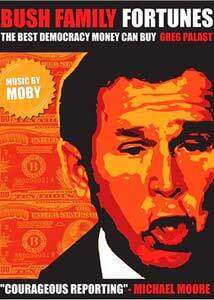 The film is based on Palast's book, The Best Democracy Money Can Buy, and trots us through the early failures of George W.: with Arbusto, with Harkin, with his father the congressman pulling the necessary strings to get his boy in the Texas Air National Guard. Ominous Moby music plays throughout, and Palast is full of innuendo and conspiracy theories—he's definitely a grassy knoll kind of guy. Image Transfer Review: Image quality is serviceable enough, especially given that lots of the footage here seems to have been shot on video and is high on contrast. Extras Review: An April 2003 interview (09m:32s) with Palast features him talking about more conspiracy stuff, and the failure of the U.S. media to report on the Florida shenanigans as evidence of "the electronic Berlin Wall in America." Better is the DVD-ROM content, featuring copies of many of the documents that Palast brandishes during the feature; a special shout out to the folks at The Disinformation Company, for making this accessible on Macintoshes as well as on Windows machines. Think different. Greg Palast is unlikely to change your mind about George W. Bush and his family; he thinks that they're sinister, and if he doesn't quite have all the goods to prove it, he's done a whole lot to shed light on Republican electoral shenanigans while stoking the fires for blue staters everywhere.